When patients are required to wear their orthoses for long duration during day and night, it is always helpful to consider the size of the patient’s extremity, the specifics of the diagnosis and the weight of the selected material for the orthosis. Orfit Industries offers an extremely lightweight material that might be appropriate for many of your patients, regardless of the specific diagnosis. Orfilight, Orfilight Black NS and Orfilight Atomic Blue NS are designed to be highly conforming, lightweight materials with a foamy feel. The comfort of the finished orthosis is obtained by the lightness of the splint, the contact with the material, and the absence of sweating. Compare the weight of any orthosis in your clinic to the weight of an orthosis fabricated from Orfilight. A volar wrist orthosis might weigh only 46 grams! All three colors are available in 3 thicknesses with multiple perforation patterns to allow for any orthotic design and any size configuration. Carpal tunnel syndrome is a condition where pressure on the median nerve in the carpal tunnel causes symptoms of pain and paresthesias. Studies have shown that there is less pressure in the carpal tunnel when the wrist sits in a neutral position. Orthoses that maintain this wrist position are effective at relieving symptoms with 70 % good results after less than 3 months of wearing. Since the recommended wearing schedule for the patient is to sleep with the splint on during the night to avoid the wrist flexion, it must be very comfortable to ensure the patient’s compliance. Also, the CTS diagnosis is more common in females and therefore the orthosis must be lightweight and comfortable. Extreme comfort can be obtained by using Orfilight, Orfilight Black NS and/ or the new Orfilight Atomic Blue NS due to the lightness and foaminess of this material. 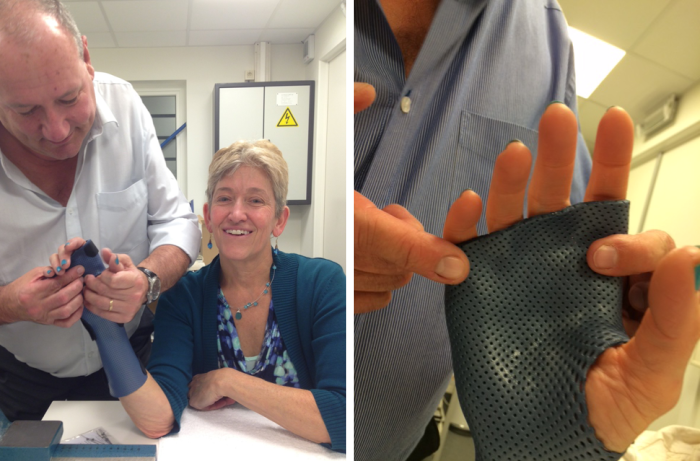 Patients may actually perspire less with these orthoses! The orthosis is molded with the wrist in neutral position, with no flexion or extension. The Velcro straps are placed with the one in the middle somewhat wider than others: the pressure is always greater in the middle of the orthosis than at the distal and proximal ends. The thermoplastic surface is not completely smooth, which allows air to circulate between the skin and the orthotic, which may help prevents perspiration. This thermoplastic material is self-adhesive, even when heated with water, and slowly stretchable. So you can use these properties to help you molding with a “third hand” as shown underneath. The edges are easy to smooth by cutting and require no edging strip on them. The thumb doesn’t need to be immobilized in this diagnosis. It is recommended that the patient wears this orthosis during the night, for a period of at least 3 months, but most of the time, the paresthesia will disappear before. Sometimes it is recommended to wear the orthosis during the day as well depending on the severity of the symptoms. Arthritis is a very common disorder that includes more than 100 different types of joint diseases and can affect people of all ages. In this article, we tell you about the basic ins and outs of arthritis, how it is diagnosed and how orthoses can help people who suffer from this common yet often misunderstood joint disease.